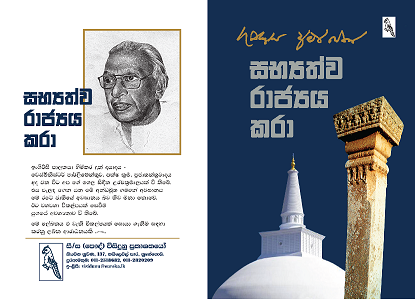 සාමාන්‍යයෙන් ජාතික ආණ්ඩු තනන්නේ බාහිර සතුරෙකුට මුහුණ දීම සඳහා හෝ රට සුවිශේෂී තත්වයකට මුහුණ දුන් විටය. අප රට කිසියම් රටක් විසින් ආක්‍රමණය කරනවා නම් අපට ජාතික ආණ්ඩුවක් අවශ්‍ය විය හැකිය. 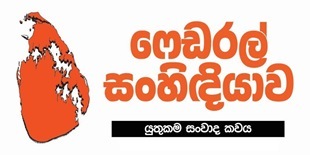 පාර්ලිමේන්තු ප්‍රජාතන්ත්‍රවාදය තුළ විපක්ෂයක් සිටිය යුතුය. ඒ ආණ්ඩු පක්ෂයේ කාර්යයන් දෙස විවේචනාත්මකව අදහස් ඉදිරිපත් කිරීම සඳහාය. එය යහපාලනයට සහ ප්‍රජාතන්ත්‍රවාදයට අවැසි අංගයකි. අනෙක් අතට ජාතික ආණ්ඩුවක් තැනූ පසු හොරු අල්ලන්නේ කෙසේද? 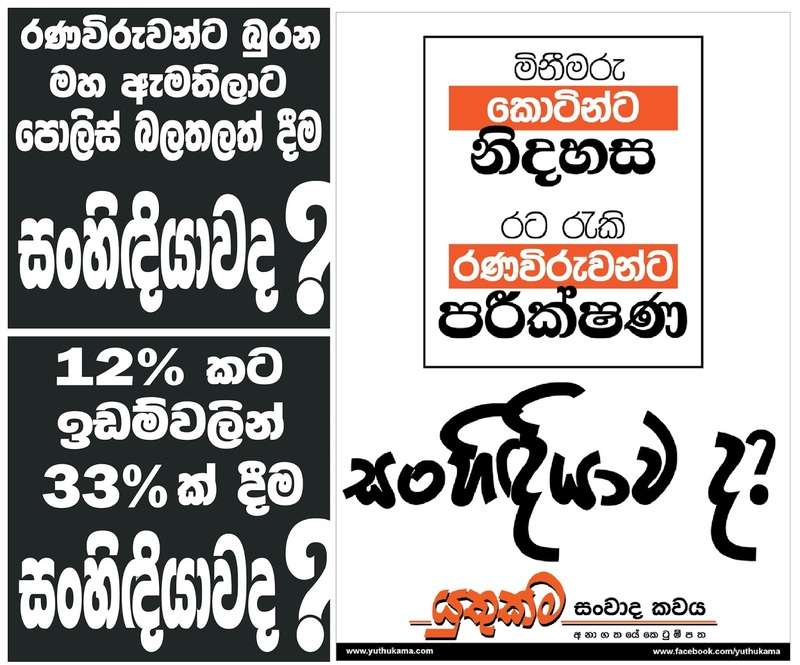 ජාතික ආණ්ඩුවේ ඇමතිකම් අරගෙන හොරු නොබේරෙයිද? යහපාලනයක් හෝ ප්‍රජාතන්ත්‍රවාදයක් යනු කුමක්දැයි සිරිසේන දන්නා බවක් පෙනෙන්නට නැත. යහපාලනය සහ ප්‍රජාතන්ත්‍රවාදයේ නාමයෙන්ම ඒවා මෙරටින් මුලිනුපුටා දැමීමට සිරිසේන කටයුතු කරමින් සටියි. ජයවර්ධන ජනාධිපතිවරයා මෙරට අධාර්මික රාජ්‍යයක් බවට පත් කළේ ධර්මිෂ්ට රාජ්‍යය සංකල්පය යටතේ බව අප මතක තබා ගත යුතුය. 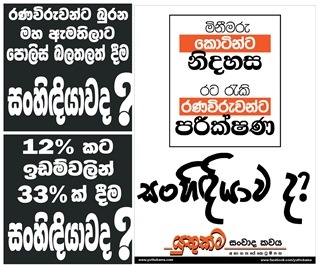 ජාතික ආණ්ඩුවක් ප්‍රජාතන්ත්‍රවාදය සඳහා හෝ යහපාලනයක් සඳහා හෝ හිතකර තත්වයක් නොවේ. ජාතික ආණ්ඩුවක් තැනිය යුත්තේ යහපාලනයක් හෝ ප්‍රජාතන්ත්‍රවාදයක් ගැන හිතනවාට වඩා බරපතල අර්බුදයකට රට මුහුණ පෑ විටය. එවන් අභියෝගයකට මුහුණ දුන් අවස්ථාවේ නොතැනුනු ජාතික ආණ්ඩුවක් දැන් කන්නද? දැන් මේ යහපාලනයක් ඇති කරනවා කියා දිවා රෑ කෑ මොර දී ගෙන පත් කළ සිරිසේන ජනාධිපතිවරයාට පාර්ලිමේන්තුව තුළ විපක්ෂයක් නැති කර දමා තමා මෙන්ම අන් සියල්ලන්ම රනිල්ගේ අණසකට යටත් කිරීමට වුවමනා වී ඇත්තේ කුමන හේතුවක් නිසාද? රනිල් එළිමහනේ සිට ජාතිය අමතමින් ලිච්ඡවි ඇප්‍රෝච් එකක් ගැන කතා කළේය. ලංකාව වැනි කිසිම දෙයක් මතක නැති මිනිසුන් සිටින රටක විනා වෙන රටක නම් රනිල් වැන්නකු ලිච්ඡවි ඇප්‍රෝච් එකක් ගැන කතා කිරීම යොදාගනු ඇත්තේ කොමඩියකය. 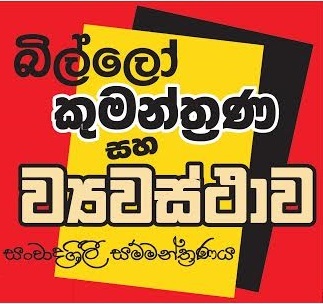 ඔහුගේ ලිච්ඡවි ඇප්‍රෝච් එක අපි දනිමු. 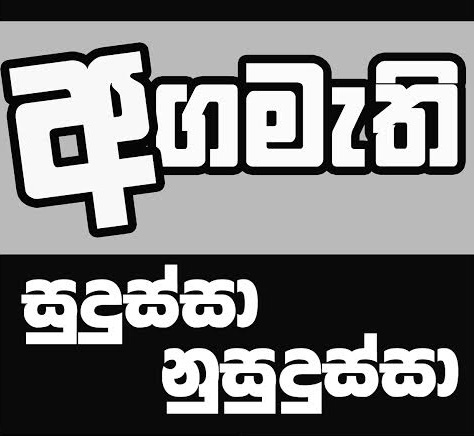 ප්‍රභාකරන් සමඟ දේශ සීමා නිර්ණය කරමින් ගිවිසුමකට ඔහු එළැඹුනේය. 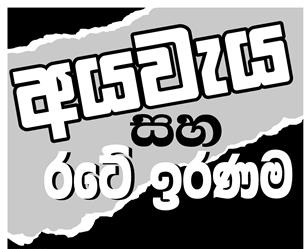 ඔහුගේ ලිච්ඡවි ඇප්‍රෝච් එක වූයේ එය අත්සන් තබන තෙක් සියළු දෙනාගෙන් එය වසන් කිරීමයි. ඊට පෙර දින විමල් වීරවංශ විසින් එවැන්නක් සිදු වෙනවා යයි ලද රහසිගත තොරතුරක් මත එහි සත්‍යතාවක් තිබේ දැයි පාර්ලිමේන්තුවේදි විමසා සිටි කල, එකල ආණ්ඩු පක්ෂයේ සභානායක වූ වි. ජ්. මු. ලොකුබණ්ඩාර මහතා එවැන්නක් සිදු නොවන බව සපථ කර සිටියේය. එහිදී ඔහු බොරු කීවා නොව. ඔහු එවැන්නක් ගැන කිසිවක් දැන සිටියේ නැත. ඒ රනිල් දැන් ලිච්ඡ්වි ඇප්‍රෝච් එකක් ගැන කතා කරන්නේ අහවල් කෙංගෙඩියකටදැයි අප කල්පනා කර බැලිය යුතුය. ජාතික ආණ්ඩු කතාන්දරය එන්නේ සිරිසේන ජනපති කරවීමේ සිටය. බෙදුම්වාදය දෙසට තබන පියවරක් පාසා ශක්තිමත් විපක්ෂයක් සිටියහොත් විරුද්ධවන බව පැහැඳිළිය. එනිසා කළ යුතු හොඳම දෙය නම් සැවොම රනිල් සිරිසේන ආණ්ඩුවකට උන්ට ඇමති දොළපිදේනි පුදා උන් එහෙයියන් බවට පත් කර ගැනීමයි. මේ කුපාඩි කමට හවුල් වී ඇමති දොළපදේනි ලබා ගන්නා පෙරේතයින් කවුදැයි දැන් ජනතාව විමසිලිමත්ව බලා සිටිනා බව උන් වටහා ගත යුතුය. සිරිසේන විසින් ශ්‍රී ලංකා නිදහස් පාක්ෂිකයින් රනිල්ගෙ යහනට නැංවූ පසු විපක්ෂය හිමි වනු ඇත්තේ සම්බන්ධන්ටය. ජාතික ආණ්ඩුව නමින් සෝභිත හිමි ඇතුළු පිරිස විසින් පුදනු ලබන ආණ්ඩුව ජනතා පරමාධිපත්‍යයට දාව නූපන් අවජාතක ආණ්ඩුවක් නොවේද? ඒ අවජාතක ආණ්ඩුව විසින් බෙදුම්වාදී පියවරයන් එකින් එක තබන විට, රණ විරුවන් යුධ අපරාධ දංගෙඩියකට දක්වන විට අර හැම පෙරේතයකුටම ඒවායේ සාමුහික වගකීම දරන්නට සිදු වේ. එවිට විපක්ෂයේ සිට මේවාට එරෙහි වන්නේ ආර් සම්බන්ධන්ද? ජාතික ආණ්ඩුවක් ඕනෑ කරන්නේ රනිල් සිරිසේන චන්ද්‍රිකා සුසංයෝගය හරහා ඊළමක් බිහි කරවා ගැනීමට මිස අන් කවරකටවත් නොවන බව අප වටහා ගත යුතුය. මේ කුපාඩි ක්‍රියාව සිංහලයන් අතර සාධාරණය කිරීම සඳහා දැන් යොදා ගැනෙන්නේ අන් කවරෙක්වත් නොව ආර් සම්බන්ධන්වමය. ඌරාගේ මාළු ඌරාගේ පිටේ තබා කපන්නටය මේ සැරසෙන්නේ. රනිල්ට ආණ්ඩුවක් පිහිටුවා ගැනීමට උදවු කරීමට තමන් සූදානම් බව සම්බන්ධන් පැවසීය. ඒ සිංහලයා රැවටීමටය. දුර නොදකින සිංහලයා එය වළකාලීම සඳහා ජාතික ආණ්ඩුවක් අගනේ යයි සිතන බව සම්බන්ධන් දනියි. 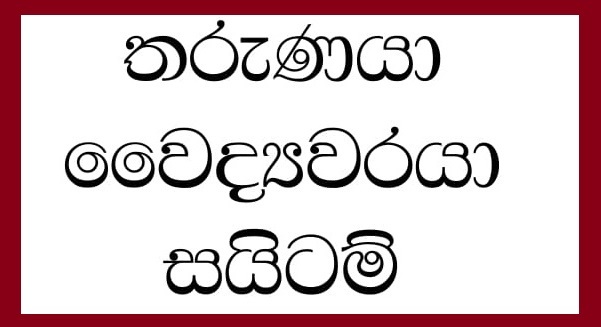 සම්බන්ධන් සහ රනිල් එක්ව ආණ්ඩුවක් තැනුවාට ශක්තිමත් විපක්ෂයක් සිටින තත්වයක් තුළ කිසිදු බෙදුම්වාදී පියවරක් තැබිය නොහැකිය. සම්බන්ධන් ඒ බවද දනී. එනිසා රනිල් එක්ක ආණ්ඩු හදන්නට නොව සම්බන්ධන්ට වුවමනා වී ඇත්තේ සිංහලයන්ගේ ඇස්වලට වැළි ගැසීමට රනිල් සිරිසේන සුසංයෝගයට උදව් කිරීමයි. ඒ හරහා අවජාතක ජාතික ආණ්ඩුව දෑ හිතකාමී ක්‍රියාවක් ලෙස සිංහලයාට කියා දීමට සෝභිත උන්නාන්සේලාට පහසුකර දීමයි සම්බන්ධන්ගේ උපාය. ජාතික ආණ්ඩුව යනු ඊළම සෑදීමේ මූලික අවශ්‍යතාවයකි. සිරිසේන නම් ඉත්තා උපයෝගි කර ගෙන ක්‍රියාත්මක වන මහා පාවා දීමේ මෙහෙයුමේ එක් තීරණාත්මක කඩඉමකි මේ. 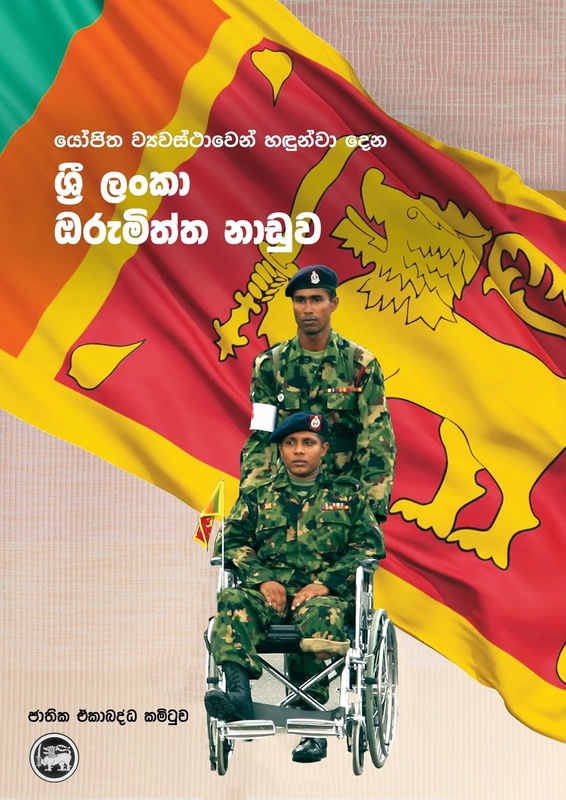 ජනතාව පනින උන් ප්‍රතික්ෂේප කර ඇත. නමුත් බලය අතහරිනවා කියා ගල් පැලෙන බොරු දෙසා බලයට පැමිණ, උන්මත්තක ලෙස සිය බලය භාවිතා කරන සිරිසේන ජනතාව එපා කියූ උන්ව ජනමතයට පයින් ගසමින් ලයිස්තුවෙන් ඇතුළට ගන්නට සැරසෙයි. මේ හැම දහජරා වැඩක්ම අවසාන වශයෙන් උදව් වන්නේ බෙදුම්වාදී වුවමනාවන් ඉටු කරලීමට බව අප වහ වහා වටහා නොගතහොත් රනිල් සහ සිරිසේන මේ රට මරණ මංචකය දක්වාම ඇදගෙන යනවා නියතය. ඔවුහූ අපගේ නායකයෝ නොවෙත්. 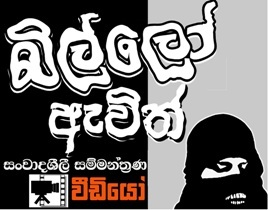 ඔවුහූ අපගේ සතුරන්ගේ ඉත්තෝය. ඔබේ මනාපය ඇත්ත කියන යුතුකම ෆේස්බුක් පිටුවේ ලකුණු කරන්න. මේ ලිපිය සැම රටට ආදරය ඇති රට වැසියෙක්ම කිවයුතුය. නැවත මතක්කරගනීමට. ඉදිරියට අපට මුණ පාන්න වන නස්පැත්තිය කල්තියාම දැනගන්න. 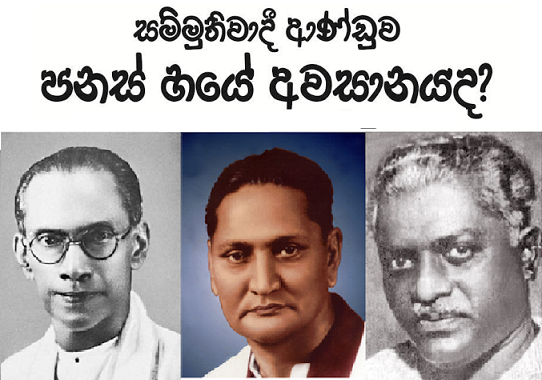 අපි මේවා නොදන්නවා නොවෙය්. අපේ වටිනා චන්දය කොල්ල කෑව. 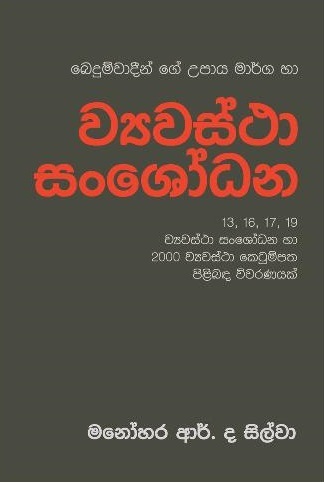 අපි දැන් හරි අසරණවෙලා ඉන්නේ. මේ අවනඩුව පැමිණිලි කරන්න කෙනෙකුත් නෑ. තැනකුත් නෑ. අපට මර්දනය කරගන්න බැරී අවස්ථාවල් වලදී පළමුව පොලිසියද, දෙවනුව හමුදාව දමා පාලනය කරනවා නේද.? At this moment in time no matter how much we tell the truth the fact of the matter is that the majority is not willing to listen to it! The people who tell the truth will be labelled as racist and accused for disrupting the mandate of the people! In such instances the prudent thing is to allow for things to take its course and be a silent bystander; while being a silent bystander the education of people to the dangers facing the country has to be sent to society to understand the future dangers facing the country! This moment is for unscrupulous elements we should wait patiently to see what their approach is! A government has to perform to win the confidence of its people if you play with peoples sincerity you cannot last long in power!Moderates know how the president and a former president did everything in their power to prevent Mr. Rajapaksa from regaining power! With all the obstacles thrown at him he managed to obtain 95 seats on his own! This is no mean feat. The sad fact of the matter is if Mr. Rajapaksa had contested independently he would have garnered more seats! 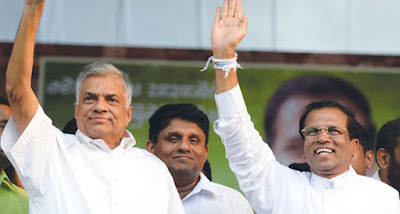 His loyalty to the SLFP cost him dearly whereas the SLFP shrewdly used Mr. Rajapaksa to garner a sizable number of seats and then cleverly discarded him and jumped on to the bandwagon of Mr. Sirisena who did everything in his power to hamper Mr. Rajapaksa! It is truly disgusting and abhorrent to witness such events, but sadly our society has gone into a limbo and are tacitly supporting such underhand tacticts! Mr. Rajapaksa faced all obstacles on his own and even now faces lots of ridicule, criticism and is being branded as a power hungry man! Why? What did he do so wrong to the country? Why did people support the side that always stood for federalism and never supported the war when that was the time the need was for a national government? These questions have a simple answer. The total plot was to defeat Mr. Rajapaksa and incarcerate him politically and this plot has worked twice in favour of the elements who wish to take Sri Lanka in a different direction from a nationlistic nation to a pluralistic nation dancing to the dictates of Indian and Western influence. This has been made possible by the fact that the Sinhalese leaders are power hungry and do not have a sense of responsibility toward the nation but seek personal glory and is aided and abetted by the Buddhist clergy who are dependent on such politicians!When the chief prelates of the Asgiriya and Malwatte Chapter, Sobitha and Rathana theros openly engage in endorsing the unethical ways of Mr. Sirisena what more can you expect! We have turned into a resurrected baptized buddhist society incapable of deciphering the right from the wrong! History is a funny thing; it ha s a way of repeating itself! events of 1815 are unfolding in 2015! How many know that the present masterminds are descendants of those who back in 1815 acted as spies for the foreign invaders? I don't think that even 1% of the population is aware of these facts! That's why history was taken out of the school curriculum in a crafty manner! What makes the tamil and muslim society different from us, they never allow their people to forget their roots and rally on the theme of nationalism despite differences! This is the trap that the Sinhalease have fallen into and will continue to fall into due to their blind foresight! Anagarika Dharampala hit the nail right on the head so did defeated LTTE leader Prabhakaran, Sinhalease have very short memories and are a capable of being manipulated! Mr.Rajapaksa is a nationalistic to the core but is branded as a racist due to this very fact, whereas the Wickremesinghes, Sirisena's and Bandaranaike Kumaranatunga are more marketable due to their liberal approach since they are pawns of imperialistic forces!They only hold sway over present society, that is the fact of the matter and in the end this country can never ever progress due to the internecine fighting among the sinahlese! සිංහල අපි බහුතරයක් රට මුහුණ පා ඇති අනතුර වටහා ගත් බවත් ඊට එරෙහි වීමට මහින්ද රාජපක්ෂ මහතාගේ නායකත්වය සහිත සන්ධානය වෙනුවෙන් තම වටිනා චන්දය පාවිච්චි කළ බවත් මගේ විශ්වාසයයි. අපේ අවාසනාවට ඉතිහාසයේ කර ඇති පරිදිම එ.ජා.ප.ය හා ආප්ප සිරිසේන ප්‍රමුඛ නඩය අපේ චන්දය කොල්ල කා විකෘති කරන ලද ප්‍රතිපලයක් ලබා දී ඇතත් විරුද්ධ වීමට කළ හැකි දෙයක් නැති බව පෙනේ. නමුත් ජනතාව නිහඬව බලා සිටින්නේ නිදි බරව නොව අවදියෙන් බව හැඟේ. නමුත් දැන් ජනතාවට කිරීමට කිසිවක් ඉතිරිව තිබේද යන්න ප්‍රශ්නයකි. කෙසේ වෙතත් සිදු වන දේ දෙස විමසිල්ලෙන් බලා සිටිමු නිවැරදි අවස්ථාව එළඹෙන තුරු.